This beer is made from the finest Saaz (Zatec) hops, assorted Moravian malted barley, a special original yeast culture and high quality pure spring water, drawn from artesian wells 300 m deep below the brewery. Six medals from the world competition “World Quality Selections”. “Beer of the Year 2001, 2002, 2003, 2004, 2005, 2006”. 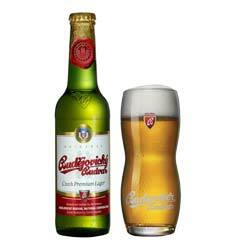 Budejovicky Budvar was also awarded the title “Beer of the 20th Century”. A wonderful, creamy malt character, and a very delicate, almost perfume flowery hop aroma.